EL SEGUNDO, Calif., Oct. 10, 2012 -- Boeing [NYSE: BA] has been selected by SES S.A. [Euronext Paris and Luxembourg Stock Exchange: SESG] to provide a new satellite that will expand direct-to-home broadcasting and other communications services to the fast-growing markets of Northeast Asia, South Asia and Indonesia, as well as maritime communications for vessels in the Indian Ocean. 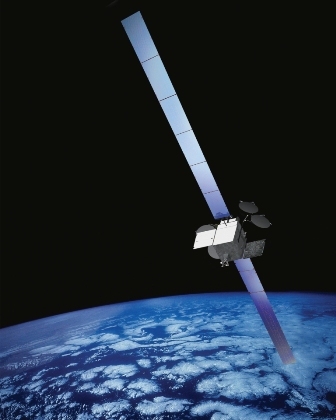 SES-9 -- ordered through SES' affiliate company SES Satellite Leasing Ltd. -- will be a Ku-band 702 High Power (HP) satellite. Boeing has a 25-year relationship with Luxembourg-based SES. This is the 11th spacecraft that SES has ordered from Boeing and the contract includes an option for another. Financial details are not being disclosed. SES-9 will be built in Boeing’s El Segundo Satellite Development Center and is designed to operate for 15 years in geosynchronous orbit with a 12.7-kilowatt payload and 57 high-power Ku-band transponders, equivalent to 81 36-MHz transponders. "We look forward to working again with Boeing on an important addition to our global fleet," said Romain Bausch, president and CEO of SES. "SES-9 will greatly expand our transmission capacity over Asia, while adding increased flexibility and redundancy to a strategic orbital slot. SES is convinced that Boeing's 702HP will prove to be mission-critical in order to provide state-of-the-art, high-power satellite capacity to the thriving markets of Asia." "We are pleased to be selected by SES to build a highly flexible 702HP satellite, which has a uniquely configured xenon ion propulsion system and chemical bi-propellant system, reducing the spacecraft's launch weight while allowing for maximum payload capacity," said Craig Cooning, CEO of Boeing Satellite Systems International and vice president and general manager of Boeing Space & Intelligence Systems. "Boeing has continuously evolved the 702 design since it was introduced over 15 years ago, allowing us to provide SES a satellite that will be consistent with their business requirements." The spacecraft will be positioned at 108.2 degrees east longitude and provide incremental as well as replacement capacity to this well-established SES slot over Asia. SES-9 will be colocated with SES’ existing SES-7 and NSS-11 satellites. SES is a world-leading satellite operator with a fleet of 52 geostationary satellites. The company provides satellite communications services to broadcasters, content and Internet service providers, mobile and fixed network operators and business and governmental organizations worldwide. SES stands for long-lasting business relationships, high-quality service and excellence in the broadcasting industry. The culturally diverse regional teams of SES are located around the globe and work closely with customers to meet their specific satellite bandwidth and service requirements. SES (Euronext Paris and Luxembourg Stock Exchange: SESG) holds participations in Ciel in Canada and QuetzSat in Mexico, as well as a strategic participation in satellite infrastructure start-up O3b Networks. Further information under: www.ses.com.